"Matters of Honor" launched Babylon 5's third season with the introduction of the White Star, a spacecraft added to enable more of the action to take place away from the station. Also introduced was Marcus Cole (Jason Carter)--in another nod to The Lord of the Rings, a Ranger not so far removed from Tolkien's Strider. In "Voices of Authority" the show finds an epic scale as Ivanova seeks the mysterious "First Ones" for allies against the Shadows, and evidence is discovered pointing to the truth behind President Santiago's assassination. A third of the way through the season "Messages from Earth," "Point of No Return," and "Severed Dreams" prove pivotal, changing the nature of the story in a way previously unimaginable on network TV. 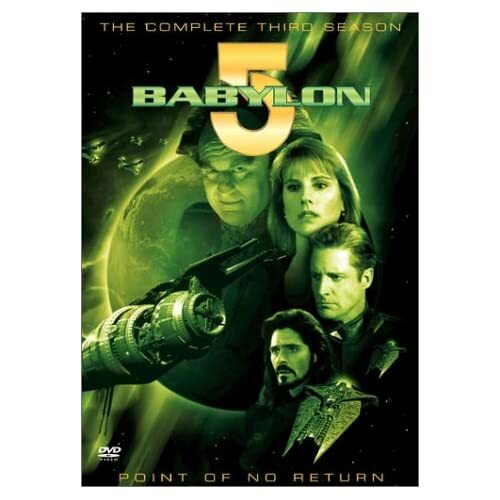 Earth slides into dictatorship, the fascistic Nightwatch takes control of off-world security, and Sheridan take decisive action by declaring Babylon 5 independent. "Interludes and Examinations" presented the death of a major supporting character, while the two-part "War Without End" reached apocalyptic dimensions in a complex tale resolving the destiny of Sinclair and the fate of Babylon 4 (dovetailing elegantly with the events of the first season's "Babylon Squared"), resolving a 1,000-year-old paradox and presenting a vision of a very dark future for Sheridan and Delenn. All this was trumped by the monumental "Z'ha'dum." In the preceding "Shadow Dancing" Anna Sheridan (Melissa Gilbert, Bruce Boxleitner's real-life wife) returned from the dead, no longer entirely human. In the mythologically resonant climax Anna invited Sheridan back to the Shadow homeworld with no hope of survival. Just as in The Lord of the Rings Gandalf fell into the abyss at Khazad-Dum, so Sheridan took a comparable leap into the unknown on an alien world.